What is that you say? SWAG! 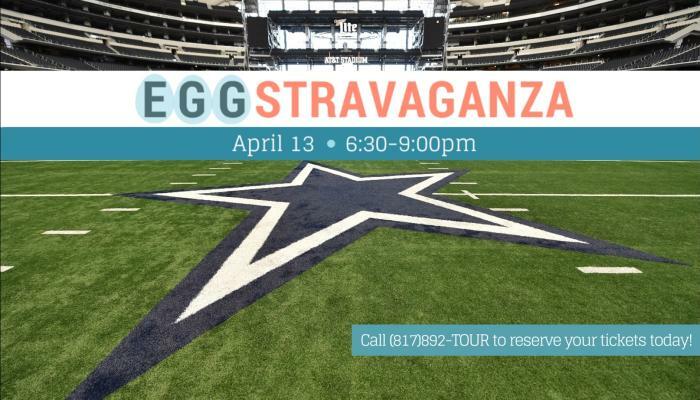 There will be egg-related activities, but the tour will include the opportunity for all involved to win a coveted Dallas Cowboys merchandise item. Score! Yet another chance of winning something great, many of the area’s exciting local attractions are hosting raffles for tickets, merchandise and more, so don’t miss out. With pricing typically ranging from $14.50 for children and seniors and $17.50 plus taxes for adults, you and the little ones get to tour the Cowboys locker room, Cheerleader locker room, the field, the post-game press room and Miller Lite Club – all for the super special price of $12. Contact Michael Lineman at (817) 892-4524 OR Zach Siewert at (817) 892-4666 to purchase tickets. Starting at 6:30 pm and running through 9 pm, this is the perfect after-work activity for families, especially since most places are closed for Good Friday the following day. Expect to see the happy, fun-loving Rowdy making friends and bringing his loveable shenanigans to this event for all to enjoy.